There's a water line leaking behind the bathroom hamper my '03 T2670. I can't figure out how to get at it. Does anyone know how to access that area? You removed the hamper itself, and you don't see the leak inside the door next to it? No. I don't know how to remove the hamper. And I think the leak originates in the water line behind the hamper. 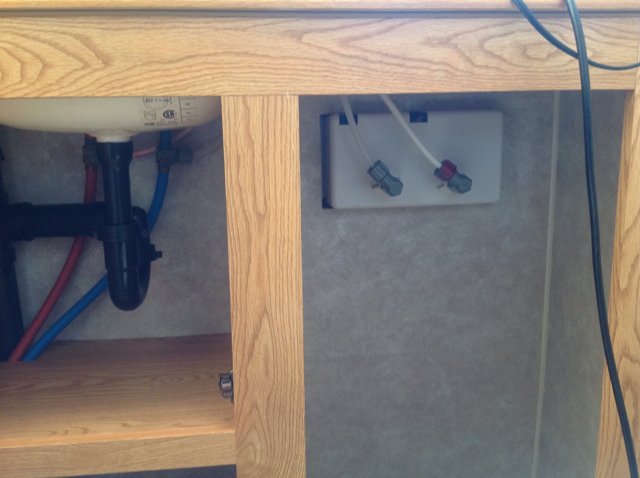 Water then finds its way to the under-sink cabinet. It doesn't have regular style cabinet hinges screwed on the bottom? I've never had one of these hampers personally, so I don't know exactly how they are mounted. If the hamper part is like a plastic trash can, is it slotted or just screwed on so you can remove to see more? Thanks, Sunline Fan! You were correct, the hamper was attached at the bottom by 4 screws. Once I took those out the hamper slid right out. 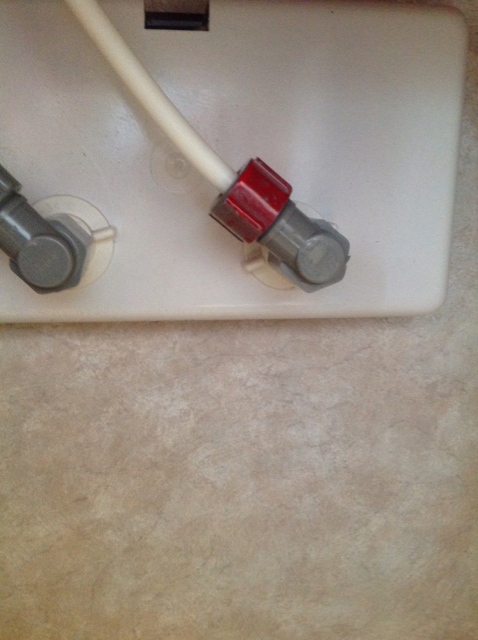 The leak was just caused by a loose fitting on the hot water supply line to the outdoor shower. One last question. Hand tightening it has stopped the leak. Do you know if it's advisable to put a wrench to it, as well? You can, just to make sure it doesn't work loose again. I wouldn't go more than about 1/4 turn with small pliers.